JAiMS is not your typical hip-hop artist. He uses his experiences growing up in suburban New Jersey, his relationship with God, and pure talent to craft a one-of-a-kind sound. 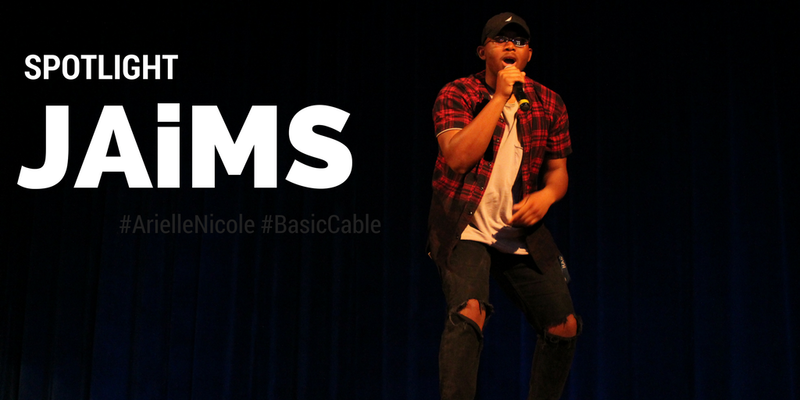 JAiMS' latest EP, Basic Cable (now on Apple Music), is one of the most innovative projects of 2017, as he somehow channels Frank Ocean and Chance the Rapper while still sounding like his unique self. We spent over an hour talking about this new development, his musical inspirations and much more. Arielle Nicole: Basic Cable is on Apple Music; you're fancy! How'd you get to this point? JAiMS: [Laughs] I've been working on Basic Cable since last summer...it started out as a project called Roses, which was inspired by Big Sean's Dark Sky Paradise; my producer Kelly Kell and I wanted to make a record that had a darker feel, but everything we were writing just wasn't fitting that. Roses turned into 101, which was a play on words. We were headed back to the basics, which somehow ended up being Basic Cable as we know it today. AN: I just have to say, I personally love this album, especially the transitions! They definitely give me Channel Orange vibes. You're comedic in a way that isn't like Frank [Ocean] though, he's got a very dark sense of humor. JAiMS: Yeah definitely. I like to have fun with my music, I want it to make people feel good! It's all about positive vibes. One of my favorites on Basic Cable is called "Middle East". AN: How long have you been making music? JAiMS: Since high school. I grew up in Sayreville, which is a very white environment. I stayed mostly with the other black kids, but they were usually athletes, and I'm not that athletic [laughs]. There's a slight music scene where I'm from, but it really all just came from myself. Music was my way of expressing myself before I got to Hampton. AN: Coming from a place without strong musical influences, what's it like being a part of this giant collection of recording artists at Hampton? JAiMS: It's great because there's no competition here. Everyone collaborates with everyone else, you know, I might have a track with Zay Blaze here, and I might bounce ideas off of 4AM/Chef Jimmy; anything can happen with the other artists, really. I've actually got a song with MoThoro in the vault. JAiMS: My sound? I'm not like anybody else. I make music my mom can hear, so I don't cuss in my music. I talk about college life and relationships and my relationship with God. I want my listeners to relate without preaching at them. I believe that when you're more honest, you get more recognition. People like Kanye West and Chance the Rapper paved the way for me to be able to talk about the things I talk about, so for that I'm very grateful. AN: How will we know when JAiMS is in the studio? JAiMS: All the money I have goes straight to music, so I be looking wild!